Farmersgirl Kitchen: Make it Moussaka! I seemed to have a lot of bits and pieces of food left over after my visitors had been. 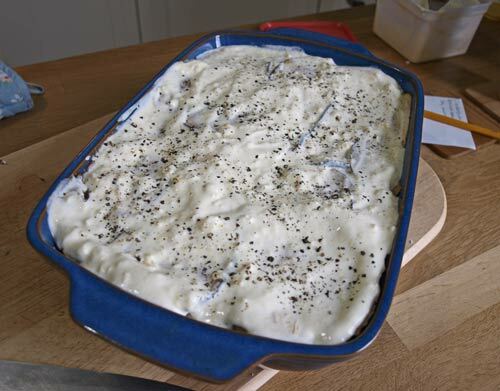 I had also bought two aubergines which were on special offer, so I decided to make a sort of moussaka. Switch on your grill to full heat. 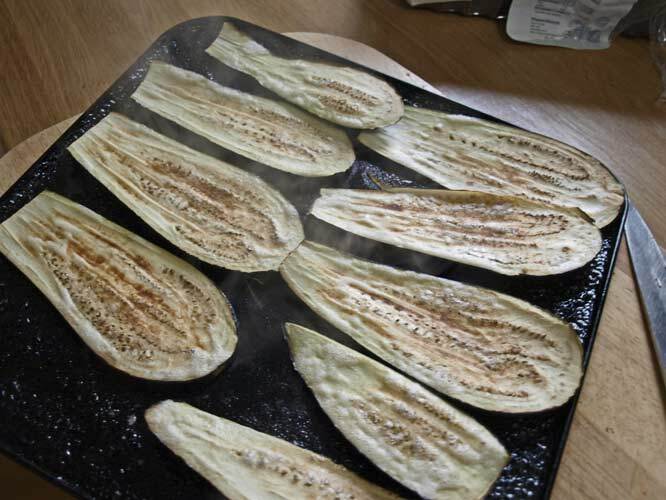 Slice the aubergines lengthways and lay out on a baking tray, brush with olive oil. 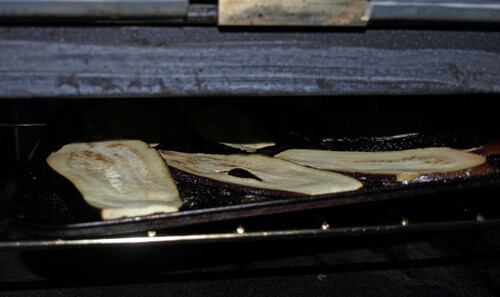 Put the tray of aubergines under the grill and gril until golden brown and soft, turn and brush with more oil. Do this until all of your aubergine slices are cooked. Fry the bacon in a little oil in a large pan, when it is cooked, add the sliced mushrooms and saute gently until soft. Add the left over chilli mixture and shepherd's pie. Add a tin of tomatoes and heat through, mixing the ingredients together. 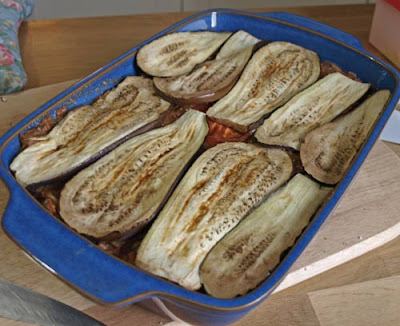 Place a layer of the mixture in the base of a large baking dish, then add a layer of aubergines, another layer of the meat and tomato mixture and then put the remaining aubergines on top. 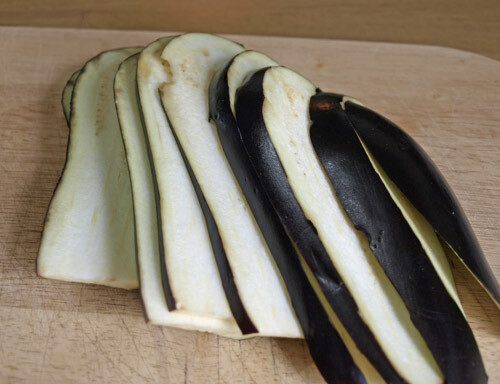 Mix together the soured cream and egg together and season, spread over the aubergines. Bake at 180C for 40 minutes until golden brown and bubbling around the edges. Serve with crusty bread and a salad. That's a very creative use of some disparate leftovers! Yum! Love aubergines and love Moussaka. Yours is a clever adaptation indeed! Thanks! I have to say it tasted pretty good too. 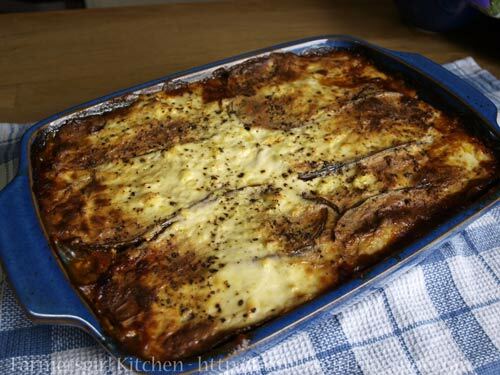 I DO love a good moussaka and this looks pretty damn LUSH Janice! I can't believe you had leftover shepherd's pie ;) ! But what a fabulous way to use up leftovers. Rachel - yes leftover shepherd's pie made from leftover roast beef!